What the opening cartoon is. Explanation of production season versus broadcast season. There were a few episodes from the first production season left over and ended up being aired in the second broadcast season. Origin of Bender's line "You killed my father and now you've come back for me!" The start of Bender's rivalry with the can opener. The veterinarian's name and it's origin. The writers all visit the same doctor often because they catch each others colds. While they recorded this commentary Ken Keeler had Pleurisy. Bender is a fan of the Harlem Globetrotters. Constant hints to buy Season 3 on DVD. What occupies Bender's chest cavity. The show won the Black Lung Award for glorifying smoking (ironically, none of the characters with lungs smoke). Matt describing the first time he smoked a cigar. At this point in the series, Zoidberg was not poor yet, only lonely and a bad doctor. The genesis of the episode was Bender feeling somebody else's feelings. The models of the characters are more consistent than they were in the first season. The PJs reference on the sewer cover and how The PJs reciprocated. Matt establishes that The PJs and Futurama are in the same universe. Matt tells a story about a problem he had with a "Let's Go Paris" guide book. The first view of the mutants was very complicated because the cell count was much higher than any of the first season episodes. The producers wanted secrets to be hidden early on in the series which would be revealed much later on. Everybody starts "dinging" when the first major secret is on screen. What the name El Chupanibre is referencing. 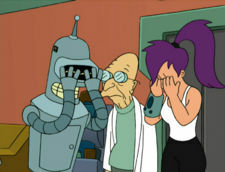 Leela's ripped shirt used to be shown a little too closely. Bender's arms have a mind of their own, explaining how he put his own arms on in the pilot. Patric is astounded that a guitar and five strings made their way down the toilet. David explains "If Bender can get down a toilet, a guitar can get down a toilet." Patric is confused about what the title of the episode is referencing. John DiMaggio: Since you have two titles I'm going to say I do more voices than Bender as well. David X. Cohen: Well I do like six other things. Patric M. Verrone: In the year 3000, they still use those big wire rollers as tables. David X. Cohen: I had one of those. Patric M. Verrone: I'm sure everyone had one of those. David X. Cohen: I think it brought its own ant farm with it, also. Patric M. Verrone: Now the chupanibre was actually based on a legend from Mexico called the chupacabra, which is a goat-headed individual, or creature, that, uhhh... does stuff. Matt Groening: [El Chupanibre] is a kind of burrito, I believe. Oh, I'm thinking of Chimichanga, yeah. Patric M. Verrone: [just before the audio track ends] And that's all, folks. This page was last edited on 5 November 2013, at 10:24.